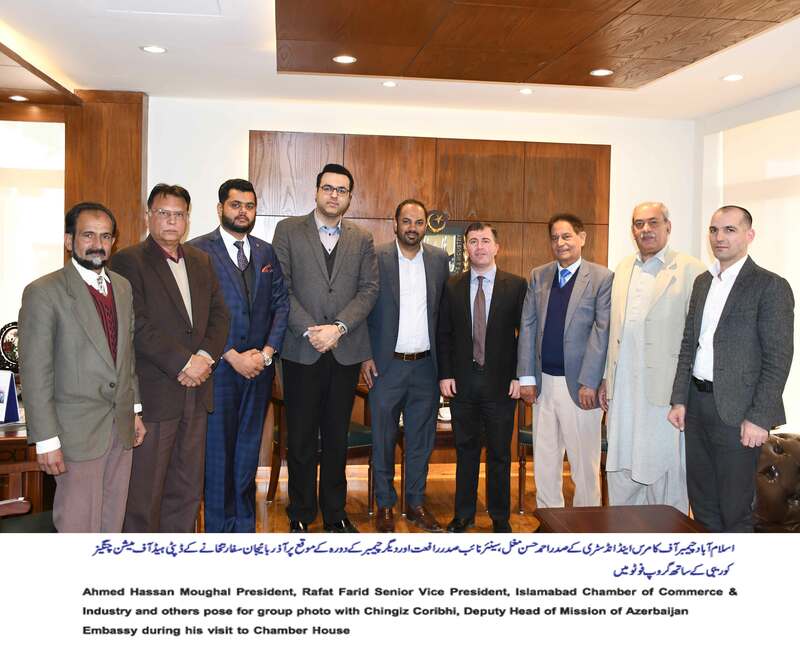 ISLAMABAD, JAN 29 (DNA) – Chingiz Garibli, Deputy Head of Mission, Embassy of Azerbaijan visited Islamabad Chamber of Commerce & Industry and said that his country was keen to further enhance trade ties with Pakistan as both countries have tremendous potential to promote trade in many areas. He said that Azerbaijan and Pakistan enjoyed excellent political relations and there was a need to focus on strengthening economic relations for mutual benefit. He said that Embassy of Azerbaijan has setup easy visa regime for Pakistan due to which visa applications from Pakistan have witnessed 10 times increase. He said that Pakistan has also announced to provide visa on arrival facility to Azerbaijan which was very good step. He hoped that this facilitation would help in promoting bilateral trade and people-to-people contacts between Pakistan and Azerbaijan. Chingiz Coribhi said that a joint trade exhibition of Pakistan, Azerbaijan and Turkey would be held in Baku, capital of Azerbaijan in April this year. The exhibition would include pharmacological, medicine, cosmetics, surgical instruments, cutlery, electrical appliances, textile, leather, sports and sportswear, furniture, home-made crafts, crafts, food and accessories. He said that Pakistani exporters should take active part in the joint expo to show potential of their products to Azeri consumers. Speaking at the occasion, Ahmed Hassan Moughal, President, Islamabad Chamber of Commerce & Industry said that Pakistan could export many products to Azerbaijan including ready-made garments, cotton products, engineering goods, consumer goods, pharmaceuticals, rice, textile fabrics, sports goods, surgical instruments and tents and can import non-ferrous metals, oil and oil products, canned fruit juices, raw cotton, and liquefied petroleum gas from Azerbaijan. Rafat Farid, Senior Vice President ICCI said that Azeri investors have good potential to invest in Pakistan’s oil, gas, mineral and petrochemical sectors. He said the investors of Azerbaijan should also explore JVs and investment in CPEC project.